A native of Philadelphia, George McClellan would today be described as a prodigy. He entered the University of Pennsylvania at age 13, but he decided on military service and was accepted at the U.S. Military Academy at West Point at age 16, the minimum age being waived. He graduated second in his class and was commissioned in the U.S. Army Corps of Engineers. General George B. McClellan was overly careful in his planning and preparations, but was charged to form the Army of the Potomac to protect Washington. He became general-in-chief of the Union Army when General Winfield Scott retired and seemed destined for greatness. President Lincoln evaluated General McClellan by saying, "If he can't fight himself, he excels in making others ready to fight." “Little Mac,” as he was affectionately called by his troops, or "Little Napoleon" was often cautious and reluctant to commit reserve forces because he was convinced that he was outnumbered. He relied on numbers given to him by Allen Pinkerton, head of the Pinkerton Detective Agency and whose men were acting as Union intelligence gatherers, but McClellan was not very good at judging the numbers of of field military. In 1862 when he slowly inched his way up the Chesapeake peninsula towards Richmond, McClellan was convinced that the Confederates numbered 100,000 and would offer too much resistance; in fact, the Confederates numbered only 10,000 but appearing to have greater numbers using deceptive tactics. 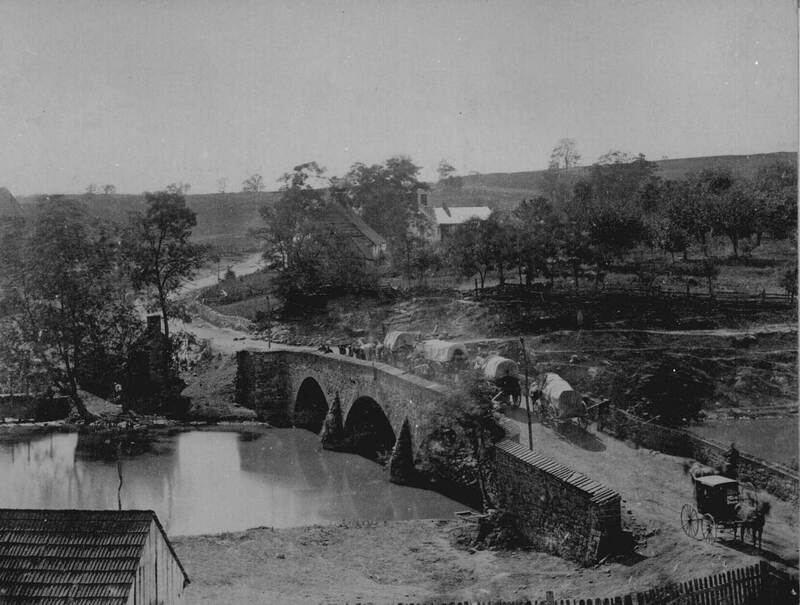 In September 1862 photographer Alexander Gardner captured this image of soldiers and wagons crossing the bridge just outside of Antietam, Maryland. 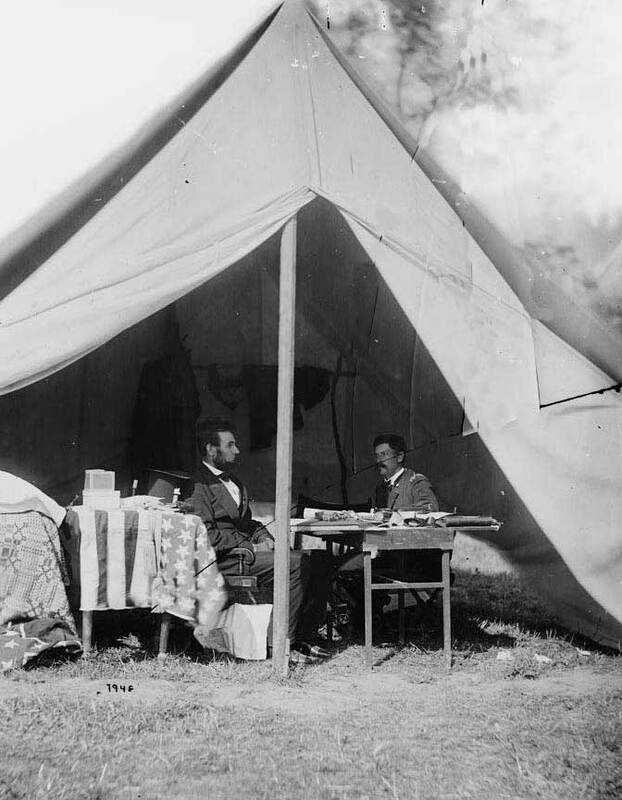 Shielded from the sun, Lincoln is shown in the above photo conferring with General McClellan in his tent after the Battle of Antietam. McClellan's army halted Lee's Confederates in an extremely bloody battle near Sharpsburg, Maryland; Lee was attempting to invade the North. General McClellan was criticized by Lincoln for allowing Lee’s army to retreat and escape rather than pursuing and destroying them. 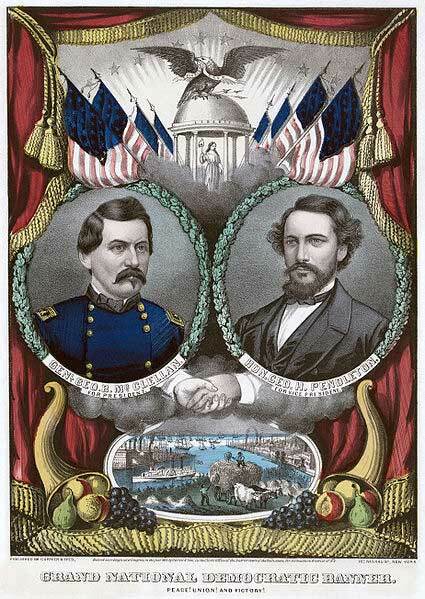 Lincoln became increasingly impatient with General McClellan's slowness to initiate and attack. Although the Battle of Antietam was considered a draw, Lincoln promoted as a crucial Union victory and used it to subsequently announce the Emancipation Proclamation a few months later in January 1963. 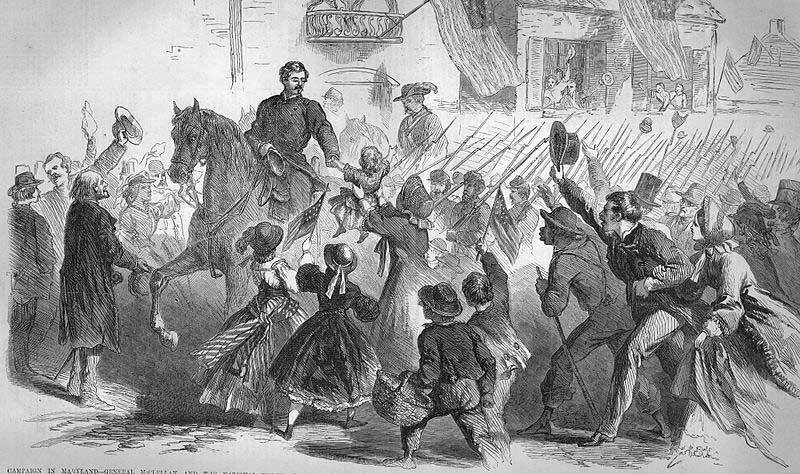 (above) McClellan is shown riding through Frederick, Maryland before the Battle of Antietam. Frank Leslies Illustrated Newspaper, 1862. 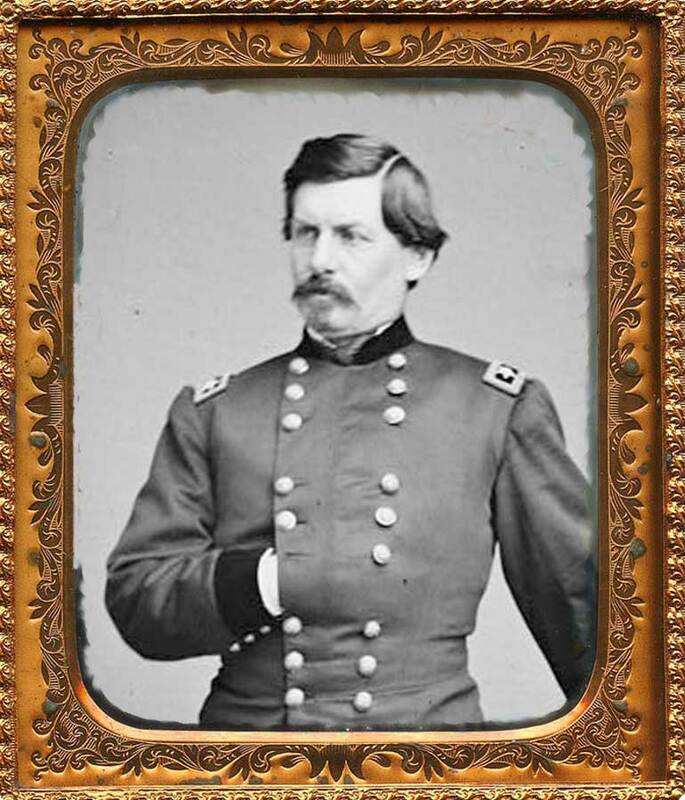 General McClellan had a dynamic personality—bold and brash—and was quite popular with the average citizenry. Given General McClellan’s on-going adverse opinions about President Lincoln’s administration and the knowledge that he was ambitious and posed a potential political threat, McClellan was relieved of command. George McClellan ran unsuccessfully against Lincoln as the Democratic Party candidate for president of the United States in 1864. Then he became governor of New Jersey and passed away in 1885. General McClellan also wrote a manual on cavalry tactics that was based on Russian cavalry regulations. The army adopted General McClellan’s cavalry manual and also his design for a saddle, the “McClellan Saddle.” It became standard issue until the U.S. horse cavalry disbanded; it is currently used only for ceremonies.